The Petworth neighborhood in DC has a reputation for its share of funkiness and shadiness. It tends to contain characters from lower-income levels that lead a “marginal” lifestyle which would make anyone a bit uneasy walking up and down Georgia Ave, its main thoroughfare. To make matters worse, its reputation for the drug activity during its yesteryears still haunts this part of town. But this is where I chose to go on a Friday night with a dining companion to try out a Spanish-style restaurant. Walking up to the place, the artistically challenged outside sign sadly does not exactly invite the street-walker (not the other kind) to pass through its doors. Furthermore, its location across from “The House” (look at the reflection in the door in the photo below – that’s the telltale sign), had many online bloggers hesitant to visit this eatery. However, in the same sweep of the pen (well, keyboard), they also praised the place for some noteworthy dishes that they claim make the trip worthwhile – I had to check it out. 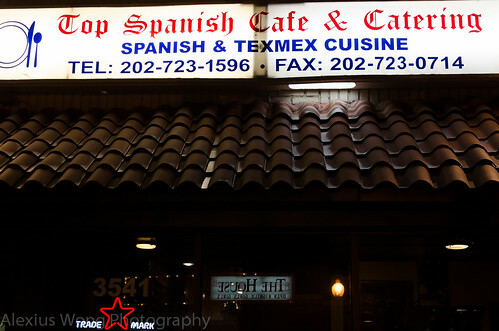 Upon entering Top Spanish Cafe & Catering, you will notice all the wood everywhere, from the half-paneling on the walls, the small bar across the front door covered in similar fashion, to the high-lacquered solid wood tables and chairs. It is obvious that this place has gone through some renovation, and the end-to-end large windows create the necessary barrier between the observer and the observed (which is which is usually determined by the characters involved). It was quite sparse on a Friday night with only another couple across from us. A sudden storm must have also scared some folks away with its veracity and high winds – it turned out to be a microburst that brought down many trees. However, despite the challenging circumstances and my friend’s uneasiness siting next to the window, I was eagerly anticipating discovering what the other bloggers had been raving about. >I decided to order a glass of Sangria, which I had read about online. It had the right balance of red wine, fruit juices, a hint of cinnamon and cloves without going overboard, and it came in a large glass with chunks of fresh apples and slice of orange. This was the perfect thirst quencher that I needed after dealing with the challenges of getting to the place. What I appreciated about this sip was that it was not overwhelming with alcohol nor was it too diluted with juice. 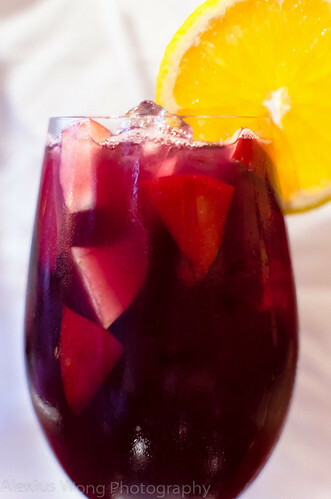 It reminded me of my college days in Spain when I was sitting in a mesón waiting for an extremely tardy friend who did not show up until nearly an hour later – when he got there I was quite tipsy and I discovered Sangria overconsumption. Time and wisdom have proven to me that all I needed was just one big glass of this juice-wine cocktail, and it was worth the $5 cost. For the appetizer, we honed in on a couple of tapas, and the first was Mejillones a la Romana. The bowl arrived filled with medium-sized mussels sitting on a pool of sauce. These mollusks were plump, fresh (not “leathery” when not at their prime), and quite briny to the point of being slightly oversalty – the waitress checked with the chef and he said he did not add any salt to the already saline bivalves. The sauce at the bottom was packed with garlic and slightly acidic from the use of white wine and some tomato sauce. I wished we had pieces of Spanish bread to dip into this wonderful elixir. It was a great start and promising beginning to this experience. The next starter was the Tender Grilled Calamari. 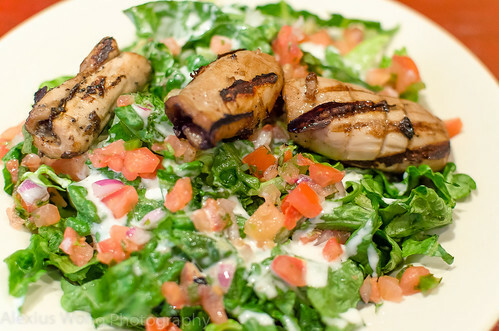 Pieces of the shellfish sat on a bed of lettuce, chunks of tomato, and red onion. The seafood was marinated in garlic, soy sauce, herbs, and olive oil. The pieces were so tender and smoky from the grilling, and we both were amazed by its texture and flavor that made these morsels extremely delectable. The green bed underneath was the perfect pairing with the squid, which provided the fresh light contrast to the smoky bites. I only wish there were more pieces of the delectable squid, but the quantity was justified given that it was an appetizer, and costing only $6 like the above mussel dish. What I came here waiting to try was the Spanish Seafood Paella. Many bloggers and reviewers had mentioned that the dish was a must-order, and ever since my first blog about another Spanish eatery, La Churreria de Madrid (see blog), I have been scouting for another locale serving this dish. And this restaurant’s rendition does not disappoint at all. 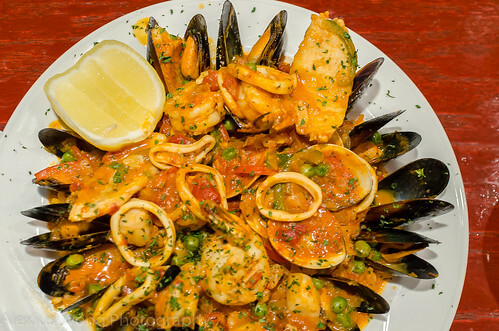 The dish arrived on the table with a ring of opened mussels, surrounding a mound brimming with clams, squid, shrimp, scallops, fish, peas, sweet peppers, and Valencian rice. The kernels of rice were the right kind being the medium-grain starchier type (should only be this varietal, no other), and they were cooked slightly al dente while exuding some starchiness, perfumed by some real saffron and sweet paprika, and enriched by a good seafood stock. 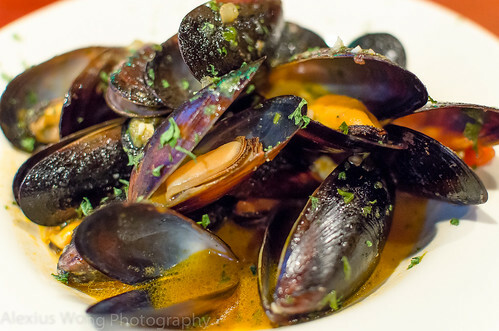 My companion and I were totally amazed by the amount of food, the freshness of the seafood (the mussels were equally briny as the appetizer dish), and the rich flavorings that permeated each morsel. It is a pity that another friend did not make it to this gathering, or not we would have ordered a large pan (paellera) of this Spanish delicacy. Upon speaking with the chef, he told us that his parents hail from Spain, and he sure knows what he is doing with authentic Spanish paella. Yes, the bloggers got this call right, and this seafood wonder cannot be overlooked here, especially when priced at $16 per serving! The chef has done stints at high-end Spanish and Latin American restaurants (Jaleo, Café Atlántico), hence the hodgepodge presence of some Latin American dishes among the Spanish ones in the menu. I couldn’t help but notice the Churrasco Argentino when perusing the menu and I decided to give it a try. 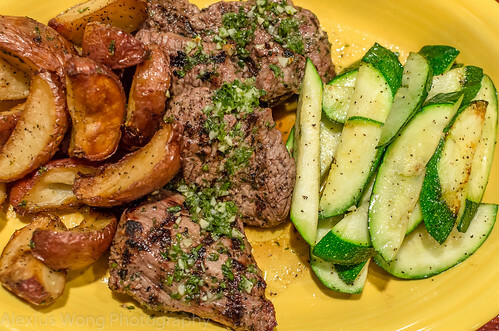 The dish arrived with pieces of beef tenderloin, accompanied with wedges of roast new potatoes and thick slices of sautéed zucchini. The beef had a rich beef flavor from some proper ageing, slight smokiness from a good stay on the grill while remaining tender and juicy, and the chimichurri sauce consisting of a blend of garlic, onion, parsley, vinegar and oil provided the interesting notes that took the meat to another level. The sides were equally impressive: the baked red potatoes were crispy and fragrant from a rub of garlic and parsley with a crispy exterior and soft fluffy interior; the zucchini slices were thick and cooked just right while maintaining some bite while exuding a slight natural sweetness which brought the some lightness to the overall meat dish. I could not get enough of this dish even though I’m not the usual beef lover. But on this night I was nearly made a convert by this tasty and relatively light (in flavor, not quantity) steak dish. Top Spanish Cafe and Catering offers Spanish-styled dishes that range from the common Tex-Mex fare to some Latin American and Spanish classics. Realizing that this is not downtown DC and in order to survive in their neighborhood, they have to cater to their surroundings with some rather pedestrian sounding dishes – interestingly, some bloggers have given complements to their Texas Nachos and Burritos. However, among them are some star dishes that point to a kitchen with expert hands that prepare some authentic and extremely delectable dishes, as in the Grilled Squid, The Mussels in Wine, Seafood Paella, and the Steak Dish. I’m looking forward to paying it another visit and savouring The Chicken in Chipotle Barbeque Sauce, The Steamed Salmon with Mango Bourbon White Wine Sauce, The Shrimp Asopao (Latin rissotto), and the Spanish Seafood Soup. This is definitely not your typical neighborhood dive with these kinds of offerings. As some bloggers have commented, this is truly a hidden gem that is worth discovering, and I can see myself a regular at this establishment in the future, waiting to dig into some good Spanish Seafood Paella. I’m quite sure you would be too after you have savoured a heavenly bite of that seafood deliciousness.